Faenza is a brillant icon set created by Matthieu James under the GPL license. Very popular, it's installed by default on many recent Linux distribution. I also choosed it as my default set of icons. 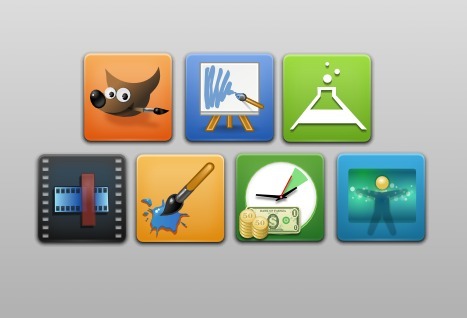 The number of icons for various applications are great , but it missed few icons to make the set complete. Thanks to the GPL license, time to a 'saturday fix this' using the wonderfull vector editing program Inkscape and share it on my blog for download if you need fancy icons for our favorite applications. faenza-new-icons.zip The above archive contain the GPL as well as a file to credit authors. I hope some of them will help the Faenza project. License: CC-BY David Revoy, www.davidrevoy.com, 12 february 2011 . Good job on your icon and cool to see I'm not alone to have the idea to fix it (^ u ^) ( even if I'm late to do it ). great job on the icons Dave. loving the Alchemy and Krita one! I already have the Faenza icons installed, how do I add this ones? I'd like to create Faenza-styled icons for RStudio (http://www.rstudio.org/) and Texmaker (http://www.xm1math.net/texmaker/), two applications I use quite a lot. Unfortunately, I'm not familiar enough with Inkscape to be able to do such a nice work as what you've done. Is there some sort of walkthrough I could find? Thanks! @Waldir : Hi Waldir, I think one of the easier way is to modify existing icon with basic inkscape knowledge : you can find all of them on /usr/share/icons/faenza/ then use your search feature on your desktop to filter only *.svg files. I'm sure you can make them by copy pasting and scaling existing element, or changing colors. Good luck ! Awesome, Gimp and Kdenlive, just what I needed. I don't like the Gimp faenza default, no Wilbur.